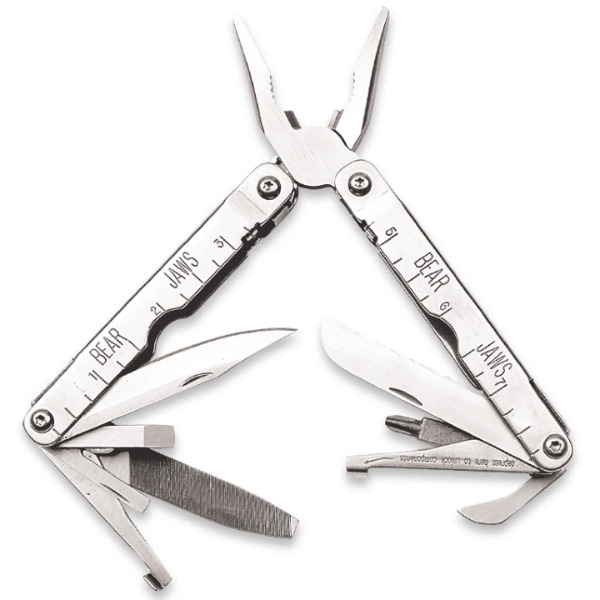 The Bear & Son 155L Bear Jaws Multi-Tool features (18) different functions and a solid stainless steel construction. The list of functions includes 2-in-1 pliers, wire cutters, electrical crimper, standard scale, metric scale, serrated sheepsfoot blade, 3-in-1 file, bottle opener, can opener, Phillips screwdriver, standard medium screwdriver and standard large screwdriver. The blade features a drop point shape and the entire tool is made of solid stainless steel with an overall length of 4-inches. Additional features include a lanyard ring, tool lock, and ballistic sheath. Each knife has a collectors stamp with a dated dotted system that is ideal for knife collectors. Highest quality materials and years of knife making experience combine to make Bear & Son knives comfortable in hand and tough enough to go the distance.